About Veterans Partnerning with Communities Inc. The Veterans Resource Center aims to provide internet access, Veterans resources and benefits information, claims processing, counseling services, in-house and outreach training workshops with collaborative strategic partnerships in business, employment, health and educational organizations and professionals. We believe that our comprehensive focused programs together with a holistic approach is the most effective way to achieve successful and fulfilling lives and career paths for our Veterans and their families. 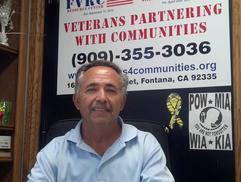 Veterans Partnering with Communities is family-owned and operated in Fontana, CA. Since opening in 2006, we’ve treated every customer like they were a part of our family. Other companies may offer similar services, but our services come with a personal touch.